I never met her, but I’m preoccupied with wondering what her life was like. I have no idea who she was, but I can’t let go of the puzzle of her habits. And all because of Little Guy and his blueberry pie — which he still hasn’t tried, by the way. Her mystery also has left me wondering what story my cookbooks will tell 45 years from now. Her cookbooks came my way this summer, a gift from an aunt who had helped a friend clean his mother’s home after she moved to an assisted-living center. I suppose I could just ask my aunt, but that would the fun out of it. The books sat untouched on my dining-room table for months, until Little Guy started pleading for pie. I have a rule: Never turn to a cookbook published later than 1980 when you want to make something homey and comforting. Later volumes, with the exception of a “Joy of Cooking” 1997 edition that’s a treasure trove, throw comfort under the train of expediency. Which is why I turned to mystery lady’s cookbooks Sunday. 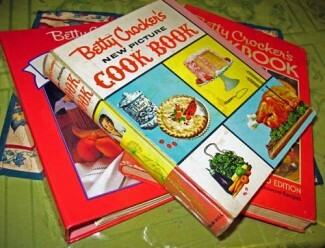 One — Betty Crocker’s 40th Anniversary Edition — looked too new and glossy. A peak at the copyright showed 1991, confirming that it wouldn’t cut it for homey and comforting. The other, though — “Betty Crocker’s New Picture Cook Book” — appearing promising. Its cover is a cheesy combination of photographs and line drawings in pastel squares. I thumbed through and saw many of the black-and-white photos featured in the Betty Crocker 1956 edition my mom used when I was growing up. Yep, there it is, on page 25 — the radish rose how-to that frustrated me prior to many a “party” I planned as a preteen. As I thumbed, I noticed something strange. No blemished pages. No scrawled notes adjusting amounts and no splotches from splashed ingredients. Other than what appears to be a coffee-cup ring on the front cover, it’s as perfect as a cookbook that old can be. I compulsively tweak virtually every recipe except for sacred family hand-me-downs. Ingredient lists are mere suggestions as far as I’m concerned. And cleanliness is next to impossible in my kitchen, though I learned the hard way to wipe the worst of the mess before closing the book, so the mess won’t meld the pages. I can’t find a copyright date, but references to “Little Caroline Kennedy’s birthday party” (the menu included roast chicken and mashed potatoes with clown faces) and Vice President Lyndon B. Johnson’s favorite Mexican fare back on the ranch (chili, “hot tamales,” enchiladas and guacamole salad) narrow the possibilities. A google search later revealed it to be 1961′s third edition. Did Betty or convention force Joy to quit her job when she added the Mrs.
Organize work: “Have a weekly plan for scheduling such tasks as washing, ironing, baking … Ironing? Betty lost me there. Refresh your spirits: “Every morning before breakfast, comb hair, apply makeup and a dash of cologne.” That assumes a degree of morning wakefulness I’ll never achieve. And women in mystery lady’s era weren’t schlepping warmed-over muffins and cold cereal to the breakfast table either. Combine jobs: “Bake cake or cookies while washing dishes or cooking dinner.” I tried that and was constantly confused about which timer was for which project. As I read, I wondered if she had been happy in that world. Did she resent being told “be interested — and you’ll always be interesting!” Or did she choose to remain a “homemaker,” even with all the other options available later in her life? Was she constantly torn between the two worlds, as I at times find myself today. Was she jazzed about the “new no-sift method” Betty trumpeted inside the front cover and cheered by chiffon — “First new cake in a hundred years!” the book says. Or was she relieved when cake mixes became common and shame-free even for homemakers? How did she handle the cataclysmic changes about to rock her world? The Pill. JFK. Vietnam. MLK. RFK. Watergate. Did she resent “women’s libbers” or secretly or openly applaud them? And if someone was a big enough cookbook fan to buy two Betty Crockers in her lifetime, how the heck does she keep them neat as a pin?